Mix the soya sauce, rice wine, honey and sesame oil in a mixing bowl and set aside. Cook the noodles according to the instructions on the packaging, drain and keep warm. Heat the peanut oil over high heat in a wok. Add the garlic and spring onions and stir-fry for 1-2 minutes. Stir in the mushrooms and stir-fry for 3-5 minutes. Stir in the bok choy leaves and the previously prepared sauce, then remove the wok from the heat. 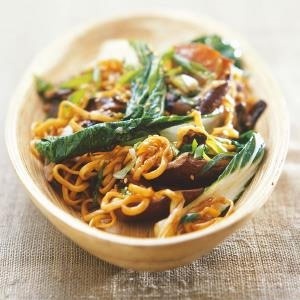 Arrange the stir-fried vegetables on the noodles and sprinkle with sesame seeds.